The retail industry is currently in a state of major transformation. Companies are faced with the obstacle of adjusting supply chain operations to better support the rise of e-commerce and omnichannel purchasing. In addition, the prominence of the Internet of Things has presented many corporations with new electronic devices and digital systems that require specialized training and updated procedures. One of the most recent technological innovations introduced to the market is digital watermarking, or DW, codes. This robotic labeling system was created through a partnership between Digimarc Corp. and GS1 US, The Wall Street Journal reported this week. According to the source, digital watermark codes use invisible identifiers on product packaging that make locating items quicker and easier than ever. The makers of the image-based system indicated that, although it could be a long time before global supply chains begin implementing them, these DW codes have the power to significantly improve end-to-end operations and build stronger relationships between retailers and consumers. In its press release, Digimarc Corp., a company that manufactures invisible identifiers, also said retailers that use this barcode technology will benefit from more efficient transaction processing and store operations. Not only will GS1 continue to comply with universal barcode standards, but it will also require specific review and approval for companies interested in using the new system. As of right now, The Wall Street Journal noted, the GS1 has about two million corporations registered across the globe. However these companies have not had to provide serial numbers for each product. To use the digital watermarking codes, however, they will have to. 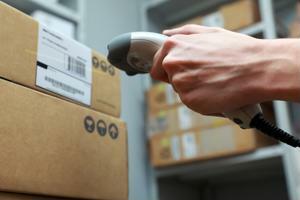 As a result, the organizations will be able to more efficiently and accurately track their items as they move through the global supply chains. "Consumer demand and the advancing pace of technology has created an unprecedented need for accurate and easily accessible product information," GS1 US CEO and President Bob Carpenter said in the statement. "Our work with Digimarc reinforces our commitment to not only collaboration, but also to providing our members with innovative solutions to address their most pressing business challenges. Together, we will transform industry by empowering consumers to make more informed purchasing decisions." GS1 also noted to The Wall Street Journal that the gradual adoption of these codes will involve supply chains using them in addition to the traditional UPC codes. Not only can this labeling technology improve customer relations, but it could also provide companies with better insight into product details, since the scannable system allows increased amounts of information to be included on the packaging.